고려 후기의 승려인 원증국사 보우의 사리탑으로, 3단으로 이루어진 기단(基壇)위로 탑신(塔身)을 올린 후 독특한 모습의 머리장식을 얹었다. 기단의 맨 밑단이 되는 4각의 아래받침돌은 각 면마다 모서리와 가운데에 기둥모양의 조각을 새겼으며, 그 윗면에는 굵은 선으로 연꽃무늬를 새겨 두었다. 8각의 가운데받침돌은 각 모서리에 원기둥을 새긴 후 면마다 큼직한 꽃무늬를 새겨 장식하였다. 원형에 가까운 윗받침돌은 굵은 선으로 연꽃을 새겼고, 꽃잎 안에 고사리무늬를 두었다. 탑신의 몸돌은 원형으로 위쪽이 좁아져서 지붕돌 밑면에 들어 맞게 되어있다. 지붕돌은 처마가 거의 수평을 이루며, 각 귀퉁이마다 꽃장식이 투박하게 솟아 있다. 지붕돌 위로는 머리장식이 있다. 고양 태고사 원증국사탑비(보물 제611호)의 건립이 고려 우왕 11년(1385)이므로, 이 사리탑은 그 이후에 만들어졌을 것으로 짐작된다. 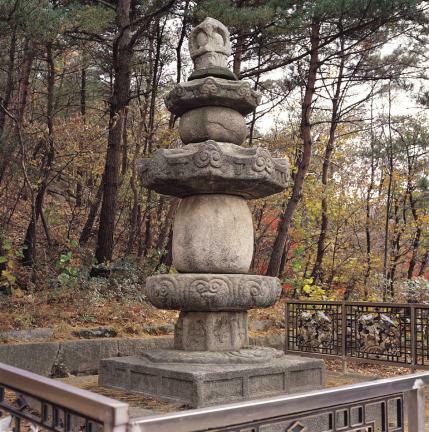 This stupa was built for State Preceptor Wonjeung of the late Goryeo Dynasty, who was also known by his Buddhist name Bou. The stupa consists of a three-layer stylobate and a main body, and features a unique top ornament. 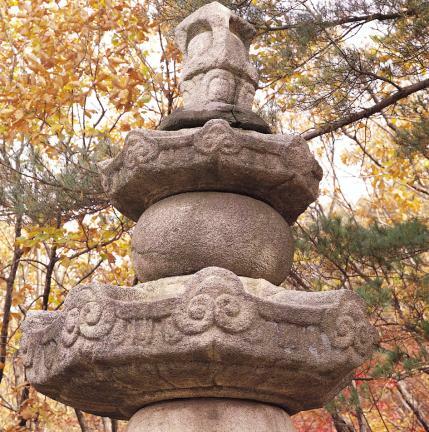 The centers of each side and the corners of the square base stone, which is placed on the bottom layer of the stylobate, are engraved with pillar patterns and lotus patterns in thick lines. 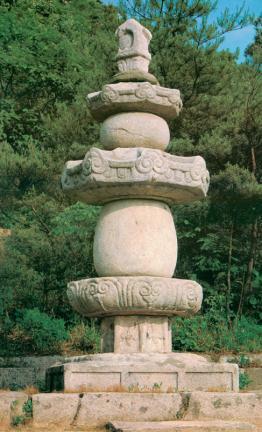 Each corner of the octagonal middle base stone of the stylobate is carved with pillar patterns and large flower designs. 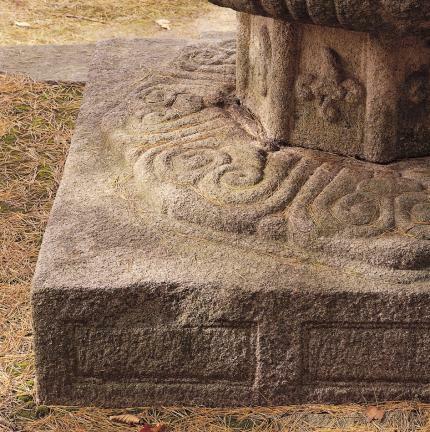 The round-shaped top stone of the stylobate is engraved with a lotus pattern in a thick line, within which the petals are decorated with a fern design. The core stone of the main body of the stupa tapers upward in size, and reaches to the bottom of the roof stone. 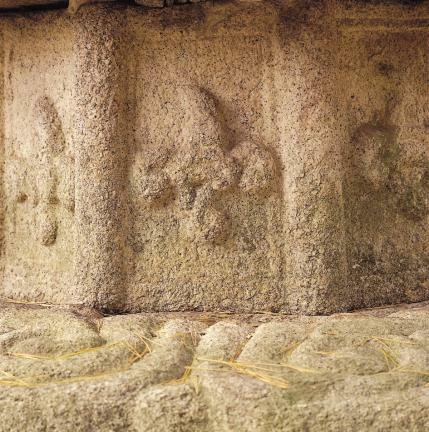 The eaves of the roof stone are almost horizontal, and each edge of the eaves is embossed with a crude floral ornament. The top ornament sits on top of the roof stone. 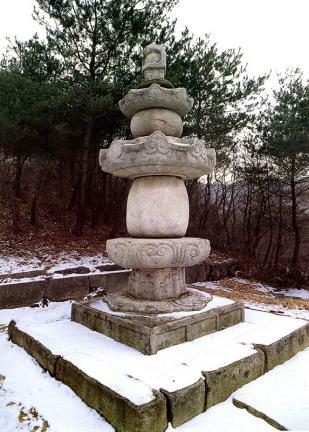 As the Stele for State Preceptor Wonjeung at Taegosa Temple, Goyang was erected in 1385 (the 11th year of the reign of King U of the Goryeo Dynasty), the stupa is believed to have been built after the stele.